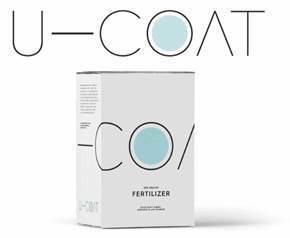 Print - Bio-on launches U-COAT, a company operating in the fertilisers market with a biodegradable controlled-release solution. Bio-on launches U-COAT, a company operating in the fertilisers market with a biodegradable controlled-release solution. The new company, U-COAT S.p.A., will sell an innovative solution for the controlled release of Urea fertilisers into the soil. The innovation was developed by Bio-on with PHAs bioplastics, so it is 100% natural and biodegradable. The Urea fertilisers market is constantly growing: +4% per year with over 180 million tons/year produced globally* and an average price per ton of €300. U-COAT is 100% owned by Bio-on and has exclusive rights to use its specific technology. Bologna (Italy), 14 March 2018 - Bio-on today launches a revolutionary new use for its 100% natural and biodegradable PHAs bioplastic. Bio-on researchers have developed a solution for the controlled release of Urea fertilisers, an enormous market with global annual production of 180 million tons* and 4% annual growth. The advantage is more effective dosage and lower fertiliser consumption. This means less pollution and a positive impact on people and the planet. Bio-on, listed on the AIM segment of Borsa Italiana and operating in the high quality bioplastics sector, has developed an innovative technology to coat Urea for fertiliser and has set up a NEWCO called U-COAT (Urea Coating). This new company 100% owned by Bio-on S.p.A. has exclusive rights to use the technologies developed by Bio-on for coating fertilisers with a natural product such as PHAs, the biopolymer developed by Bio-on, which is natural and biodegradable without leaving any trace on the environment. U-COAT will pay running royalties to Bio-on for every quantity produced or sub-licensed on the fertilisers market. Bio-on owns 100% of the technology licensed or sub-licensed through U-COAT to international manufacturers. "I am proud of the research and development our scientists are conducting," says Bio-on Chairman and CEO Marco Astorri, "to enter such a large and fast-growing market as fertilisers confirms the extreme versatility of a platform product such as our natural biopolymer. By setting up this new NEWCO, we are taking a major step towards exploiting the many technologies we are creating, which will find dedicated applications and produce the maximum economic return for each sector through sector-specific licenses. This will also allow direct partnerships to be created with leading companies in each sector." U-COAT brings to this major market a technology that will create a revolution in the use of fertilisers, particularly Urea. This type of fertiliser is usually sold in white crystals, pellets or granules. It is a very concentrated nitrogen-containing feed that is highly water-soluble so rapidly degrades and disperses in the subsoil. Urea can be used as a fertiliser at the sowing stage or on the surface, but should not come into contact with the seed. This is where the innovation proposed by U-COAT comes into play. With varying percentages depending on the characteristics of the soil, PHAs bioplastic coats the UREA granule which, thanks to PHA's natural biodegradation, will then release the fertiliser into the soil in a controlled way as and when required, leaving no trace and protecting the fertiliser from being washed away by rainfall and therefore being less effective. The innovative solution proposed for the fertilisers sector will reduce the quantities of urea used in the soil and eliminate any excess, with a consequent reduction in costs and environmental impact on the subsoil. The future possibility of applying the same technology to both other higher value fertilisers and agricultural pesticides and other complementary products will play a major part in reducing environmental impact and costs in the agricultural sector. Global annual UREA production is 180 million tons. * (Based on capacity of operative plants in 2008-09 according to IFDC Worldwide Fertilizer Capacity Listings by Plant). In 2015 FAO predicted annual output to increase by 41 million tons by 2018. This indicates annual production of approximately 200 million tons, with an annual growth rate of 4%. The average price of urea in the last 5 years is 300 Euro/ton. The application designed by Bio-on and carried out by U-COAT envisages using 1 to 4% of PHAs per ton, opening up a market of 2 to 8 million tons/year solely for fertilisers. TECHNICAL INFO: Urea is a nitrogen-containing fertiliser widely used for its high nitrogen content (80% of the urea produced is intended for this purpose, 20% for urea resins or adhesives). Many bacteria present in soil possess the enzyme urease, which hydrolyses urea into ammonia and carbon dioxide according to the reaction (NH2)2CO + H2O -> CO2 + 2 NH3, thus making the nitrogen available for plants. Urea for livestock use also exists and can be introduced into feed for ruminants, from which powerful bacterial proteins are used by the rumen micro-flora; there are also other uses in the cosmetics and diagnostics fields. It has also been recently introduced in the industrial and automotive sectors. A 32.5% aqueous solution of pure urea (brand name AdBlue) is injected into the exhaust which, via chemical reduction aided by catalysers, converts nitrogen oxides into molecular nitrogen and water (SCR Selective Catalytic Reduction). The composition and quality standards are governed by standard DIN70070. All the PHAs bioplastics (polyhydroxyalkanoates) developed by Bio-on are made from renewable plant sources with no competition with food supply chains. They guarantee the same thermo-mechanical properties as conventional plastics with the advantage of being 100% eco-sustainable and naturally biodegradable. 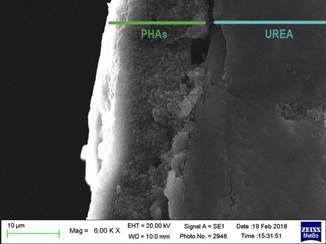 PICTURE: section microscope picture PHAs outside and Urea inside.